Trenton, N.J. – Mercer County Community College (MCCC) Fashion/Apparel Design and Fashion Merchandising students had two big moments in the spotlight this spring. 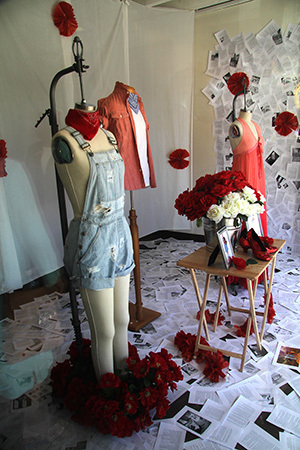 In late April, as part of the Trenton Campus's Open House, two student groups revealed colorful, creative window displays at Trenton Hall as part of a Fashion Merchandising competition. Two themes -- "There's No Place Like Home" and "Modern Vintage Beachwear" -- were unveiled to the public as students described their designs, including various obstacles they overcame as a team. Sean Dickinson, who was the team captain for the Wizard of Oz-inspired window, said, "The assignment was a good exercise in teamwork and time management." Dickinson is interested in the public relations side of the fashion industry and plans to transfer to a New York school to complete his bachelor's degree after Mercer. For Genaro Ordonez, who worked alongside Dickinson, the assignment was simply fun. "It was great collaborating with my classmates," said Ordonez, who is pursuing his associate degree in Fashion Merchandising and plans to attend the Fashion Institute of Technology to study advertising and marketing. Qaysean Williams, the team captain for the beachwear group, noted that mannequins were in short supply as his group prepared its window. "We decided we could do an attractive display by hanging the items. It was our next best option and it worked pretty well." Nora Okoro assisted Williams with the beachwear window. Okoro, who has regularly volunteered to model her classmates' designs at MCCC fashion events, is passionate about the industry, especially fabrics, and says she may eventually turn to a career in interior design. 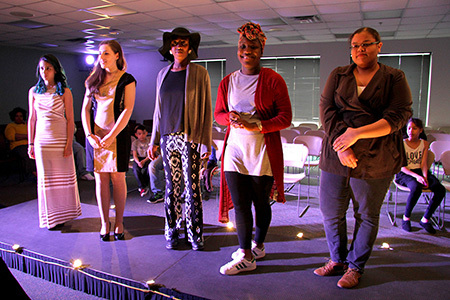 Just days after the students displayed their window designs, they turned up the lights in dramatic fashion at their "20/20: The Edge of Tomorrow" runway show at the James Kerney Campus on May 2. The show featured designs by Verity Gordon, Zalibah Griffin, Elizabeth Harris, Ayanna Knight, Windy Munoz and Stephanie Young. Instructor Kenol Lamour was the emcee for the show. DJ music was provided by Kevin Parham. A special treat was the modeling of designs by Lamour and Kate Pinner, the costume designer for Kelsey Theatre. Pinner's costumes came from period piece dramas such as "Amadeus," "A Man for All Seasons" and "Sunday in the Park with George." Lamour dazzled the crowd with fun, sophisticated casual wear. Fashions by instructor Beth Dubrow, who also served as a model, were on display next to the runway. A bonus came at the hands of Liberal Arts student Tonya Watkins, who gathered a group of youngsters to model her just-for-fun kids' fashions. They were the darlings of the runway as they sported Watkins' imaginative and colorful tutu designs. At the show's conclusion, MCCC President Patricia C. Donohue gave a hearty round of applause to all the students, observing that the runway show was a great learning opportunity. Also addressing the crowd was Board Chair Mark Matzen. The designers themselves appeared both happy and relieved. Said Munoz, "It was hectic pulling it all together. I worked at school and I worked at home. But I'm looking forward to coming back next year and doing it again." Knight noted that she had so many different ideas. "It's easier to create the clothes than to decide on what to make," she said, adding that she fuses art and nature in her fashions. "Art is the tree and fashion is one of its branches." Knight came to Mercer directly from high school intent on a career in fashion. "This is what I have wanted to do since I was 11 years old. I am happy to be part of it," she said. Knight said that she and a friend started a fashion club and engage younsters to participate through their church, United Methodist. "We do everything. We find the place and we set it up. We arrange for the music, photography and decorations. The kids love it. It's something we can all do together." Most of these students are already working in fashion and merchandising locally in stores including Coach, Fovever 21 and several bridal shops. And, while their goals in the industry vary, it's clear that they share a passion for fashion and are getting the foundation to pursue their dreams at Mercer. Sophisticated sportswear by Stephanie Young. 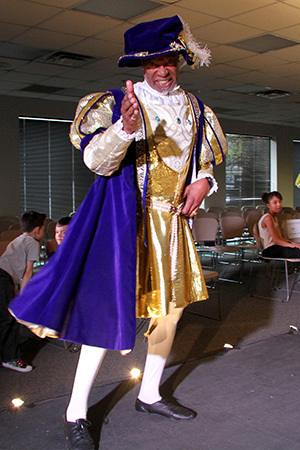 Professor of Communication Alvyn Haywood models a Henry VIII costume by instructor Kate Pinner, costume designer for Kelsey Theatre. 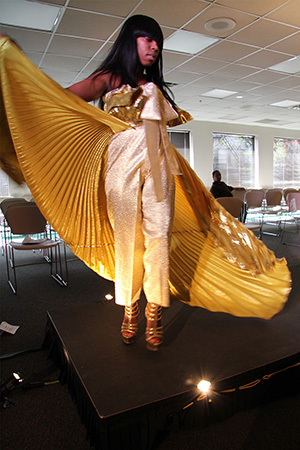 Tonya Watkins models a dazzling outfit by instructor Kenol Lamour. In the sewing lab, Windy Munoz puts the finishing touches on a child's shirt to be modeled in the show. From left, instructor Kenol Lamour with students Genaro Ordonez, Emily Bernstein, Alana Kersey, Carly Beers, Sean Dickinson, Nora Okoro, Verity Gordon, Ayanna Knight (kneeling) and Qaysean Williams. and her friends are overcome in a field of poppies. From left, Sean Dickinson, Genaro Ordonez, Alana Kersey and Carly Beers describe the process of creating their window display and shared their goals for the future. From left, designers Windy Munoz, Verity Gordon, Zalibah Griffin, Ayanna Knight and Elizabeth Harris participated in the program's May fashion show. Not pictured: Stephanie Young. 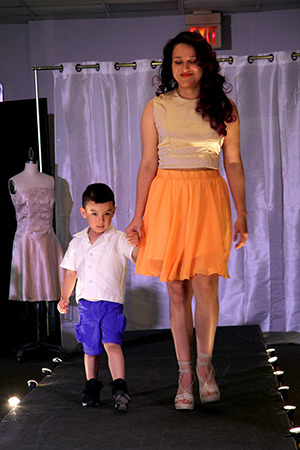 Windy Munoz featured outfits for mothers and children. For her women's wear, she selected "tasty, tangy colors" in flowing chiffon. 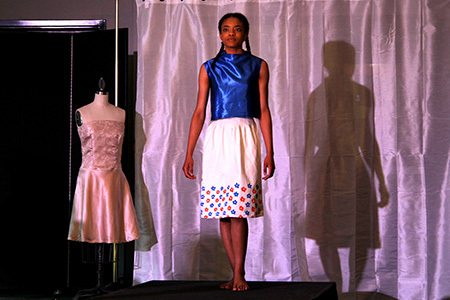 Student Nora Okoro models one of Ayanna Knight's colorful outfits. 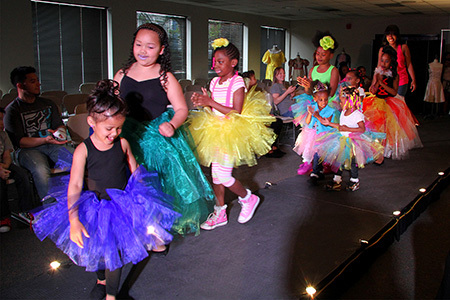 Tonya Watkins surprised the audience with her "tutu parade" of childrens' fun wear. 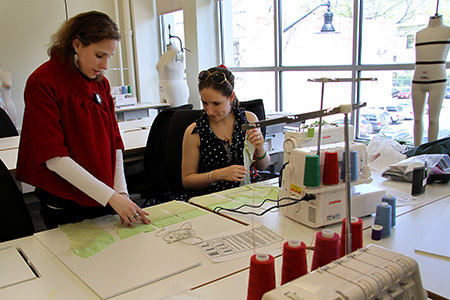 Designer Verity Gordon works with instructor Beth Dubrow on one of her designs for the show.